There are plenty of guides out there discussing how to incorporate mobile devices into the classroom, but many teachers struggle with the distractions caused by students who own personal devices. Is there a way to take advantage of the teaching potential of a tech-integrated classroom while minimizing the disruptions that personal devices can cause? For the purposes of this article, I’m going to take a set of practical classroom management guidelines penned by an expert and explore how they could be applied to technology owned by students. The expert in question is Kathleen Gould Lundy, a Canadian professor of education, and award-winning author of over 17 books on professional teaching. She has a huge library of work from which we could draw, but my favorite is this concise guide to classroom management which is an excerpt from her book Leap Into Literacy. Lundy frames the tips with three very important aspects of successful learning environments: security, affirmation, and control. Technology in the classroom intersects all of these concepts. This is the “big decision”—how controlled will the use of personal technology be? Will you ban phones, smart watches, and other Bluetooth devices outright? Or can we find ways to engage with students using their personal devices that won’t cause constant distractions? Since every group of students will have a different dynamic, it’s difficult to suggest one-size-fits-all solutions. In many cases, I believe there can be a middle ground, with limited personal device use during certain lesson activities. For the purposes of the article, I’m going to assume that you haven’t chosen to ban personal tech outright. But you know your students, so I won’t be making judgements about one policy over another. I imagine control in terms of personal tech taking a few different forms. For example, you could designate “no tech” periods of time and “tech allowed” periods of time, reducing distractions while you’re teaching and incorporating devices into group work. Depending on your particular group of students, you could run this sort of control with an honor system, or ask for device hand-ins during “no tech” time. A potential solution here is phone lockers, which puts everyone on an equal playing field. Even you can take part, if you decide it would be helpful to set an example by being the first person to lock up your devices. If there is unlikely to be a budget for this sort of thing, the class could help construct a functional alternative. This sort of firm boundary enforces the concept of appropriate times and uses for mobile devices and their peripherals. If personal devices are allowed, even in controlled circumstances or short periods of time, there are a number of security issues to consider. The biggest threats to a student’s security in the classroom are photographs and recordings. No matter what your wider device policy is, it’s a good idea to generate a social contract with your students, perhaps something they physically sign, that governs the use of cameras. Unauthorized photographs and recordings play a large part in cyber bullying, so if devices are going to be in the room at all, this is an important step. Any boundaries you create within the classroom can be extended to the outside world; there are opportunities to teach students about the importance of the privacy of others, and their own as well. Lundy suggests: “Work from where they are—with their prior knowledge, with their capacity to work together, and with their enthusiasm for certain topics and ideas.” Mobile technology has so many intersections with and applications for learning, there is a lot of opportunity for engagement through the lens of an app, a social network, or a Bluetooth device. If this is the route you want to take, new possibilities are popping up all the time, like Google’s cardboard VR goggles. I want to pause here to mention that affirmation works the other way too. For kids who don’t possess these sorts of devices, and if there are no school-issued devices, it’s important to be careful that learning is not gated behind technology. Rather than designing a lesson around mobile tech, it’s important to focus instead on ways technology can be an alternative, not superior, way to engage with the material. One advantage to confiscating personal devices is avoiding this challenge altogether, but there are other ways around it that can help teach students not to judge one another by their financial means. One strategy, for instance, could be assigning one device per group, and making control of that device a single role equal in importance to the tasks of the other group members. 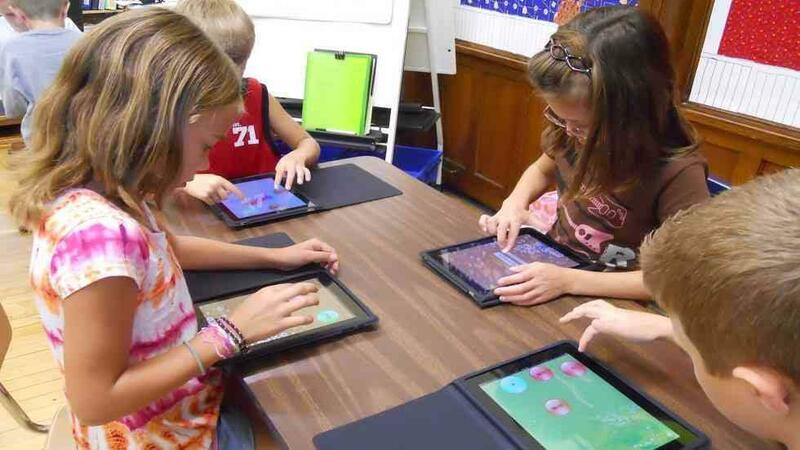 That way, a student who is particularly interested in the applications of mobile devices in the classroom can engage with the material in their preferred way, but other students are not disadvantaged, and receive equal reward from the activity. Mobile technology is getting more affordable, and so are the peripherals associated with it. Providers are jumping on the opportunity to sell innovations in wearable technology to their subscribers. It’s a good idea to keep up, even if you’re not interested yourself. Whether or not your school has devices available for your students to use, the chances are many teachers will encounter smartwatches, Fitbits, ever smaller recording devices, and other Bluetooth peripherals owned by their students. Studies on the direct effectiveness of mobile technology in the classroom are still being conducted, but the outset is looking positive. In the meantime, it’s important to think carefully about ensuring interactions with mobile technology in the classroom are positive learning experiences. Ben Steele is a writer, theater professional, and a not-for-profit administrator focused on the roles of arts & technology in education.